After a four-week SARFT-mandated absence from Chinese movie screens, American films roared back during the weekend ending July 29th, with three new releases seizing a 56 percent share of the national box office. Topping the charts, and breaking China’s opening weekend record for animated features was Twentieth Century Fox’s Ice Age 4: Continental Drift, which debuted to nearly $21 million in its first three days, easily surpassing prior record-holder Kung Fu Panda 2’s China debut by a wide margin. Ice Age 4’s take in its first three days nearly equaled the gross for the entire 2009 run of its predecessor, Ice Age: Dawn of the Dinosaurs. 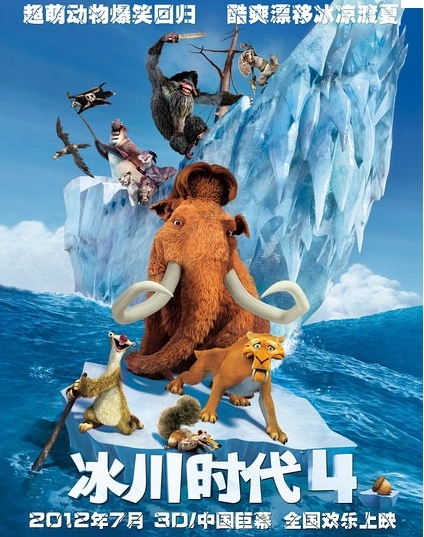 Ice Age 4 now stands as China’s fourth best overall opener in 2012 behind Titanic, Painted Skin 2 and MIB:3. Faring less well over the weekend were Lionsgate’s action-thriller Abduction, which landed in 4th place at $3.75 million, and Universal’s animated film The Lorax, which came in 8th at just under $1 million. Two China-Hong Kong co-productions continued their impressive runs. Painted Skin 2 added almost $5 million to extend its Chinese record cume to $114 million, and The Four edged ahead of Sherlock Holmes: A Game of Shadows, to become the mainland’s 10th highest grossing film this year. Fox and China Film Group execs are no doubt hoping Ice Age can build momentum and ultimately top Kung Fu Panda’s massive $92 million 2011 total. The vast disparity between last week’s grosses of Ice Age 4 and The Lorax underscores the reality that the animation business in China remains highly bifurcated, with many pre-sold franchise properties or adult-oriented animated films scoring big, while others have struggled. Perceived more as a children’s film than its competitor, The Lorax only got its release slot after a protracted lobbying campaign by Universal, and even then it was allocated only about 1,000 screens as compared to the 3,500 that went to Ice Age 4. Still, the animation medium has become increasingly popular at Chinese multiplexes, rising from $75 million and 8 percent of ticket sales in 2009 to $252 million and a 12 percent share of ticket revenue in 2011. Animation’s market share has fallen back to about 9 percent for the year so far, but if Ice Age 4 has legs and if the next installment of the successful Pleasant Goat and Big Big Wolf franchise opens well in mid-August, animated films as a group could exceed last year’s total gross. Katzenberg has the right idea about riding the China wave, securing reliable access to the market by partnering with local companies and making a tangible, long-term commitment to the territory. In doing so Dreamworks has gained invaluable government support that will provide it significant competitive advantages vis a vis its Hollywood animation rivals. This entry was posted in Box Office Reports, Opinion by chinafilmbiz. Bookmark the permalink.